I am very pleased and honored to have been awarded a 2017 North Carolina Regional Artist Project Grant, through the Arts and Science Council of Charlotte, NC and the Union County Community Arts Council. My grant request was for the funds to purchase an oxygen/acetylene torch setup to be able braze and cast my sculptural forms and units for use in my jewelry and sculptural works. This series of blog posts will document my process and journey from using the grant funds to purchase the requested equipment to properly building out and configuring my studio setup to accommodate new processes to actually creating and completing new jewelry and sculptural works. 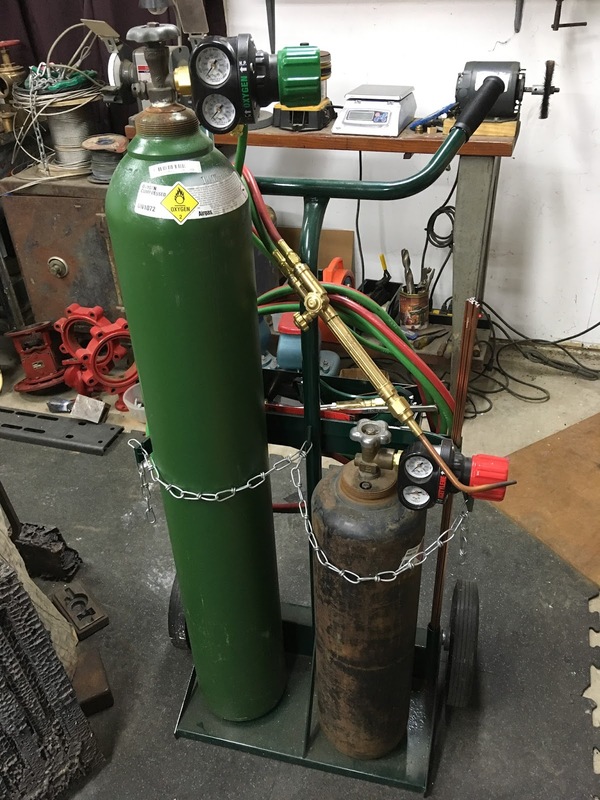 Upon receiving the grant funds, I purchased a Victor Journeyman Oxy/Acetylene torch set with the appropriate brazing, welding, cutting, and casting attachments to allow me to complete a wide variety of projects and new pieces. Setup was very straightforward, as I went ahead and bought a solid tank/torch cart to allow freedom of mobility and storage within the shop. Next, I designated an area in my shop for all large welding, brazing, and metal-melting operations. The main work-station is a welded-steel frame table with a thick heat-resistant refractory top that was once a section of the inner cooking surface of a commercial pizza oven. 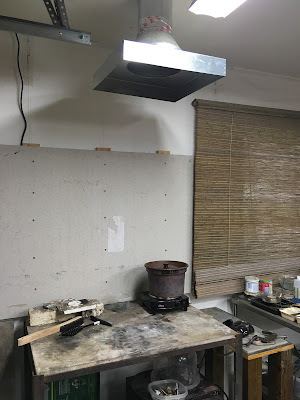 A cement-board panel was mounted on the wall above the work-table with a 1" air gap between the panel and the drywall to protect the shop wall from indirect and accidental flame and heat exposure. I then designed and installed a custom variable-speed ventilation system featuring an 18" x 18" vent hood and a 600+CFM in-line fan. The fan was installed in the attic above the workshop with direct venting to the exterior using straight-line metal ducting and a 1-way exhaust vent with damper and debris cage to prevent blockage and animal infiltration. In order to have effective wax-burnouts during the lost wax casting process, it is very helpful to have a removable wax-catching tray inside the kiln in order to collect excess molten wax from the investment molds for removal prior to full combustion. 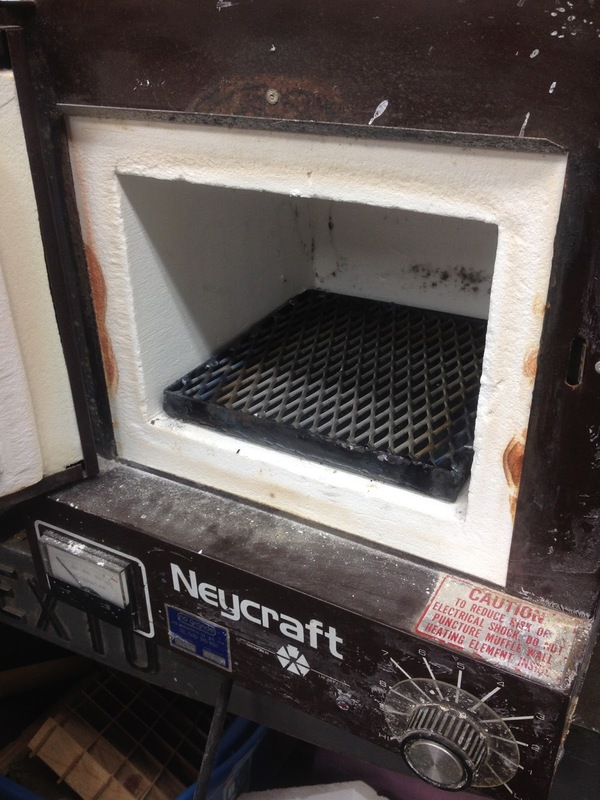 This reduces the amount of toxic fumes and gasses created and yields a cleaner overall burn-out. My first practical use of the new welding torch setup was to create a wax-catching tray from scrap steel I had laying around the shop. 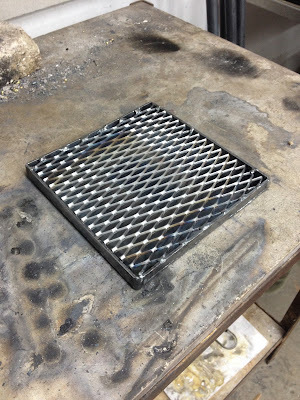 The completed wax tray with expanded metal mesh grating. The wax tray properly seated in the kiln. Next, I created a custom vacuum-casting machine on a mobile rolling base with a steel work surface to degas and debubble the plaster-like investment mold material prior to pouring my molds around my wax patterns, as well as to provide vacuum pressure through the burt-out molds during the actual metal casting process. I had an old vacuum pump given to me by another jeweler, as well as the pressure gauge, valve, and fittings from a broken casting machine. 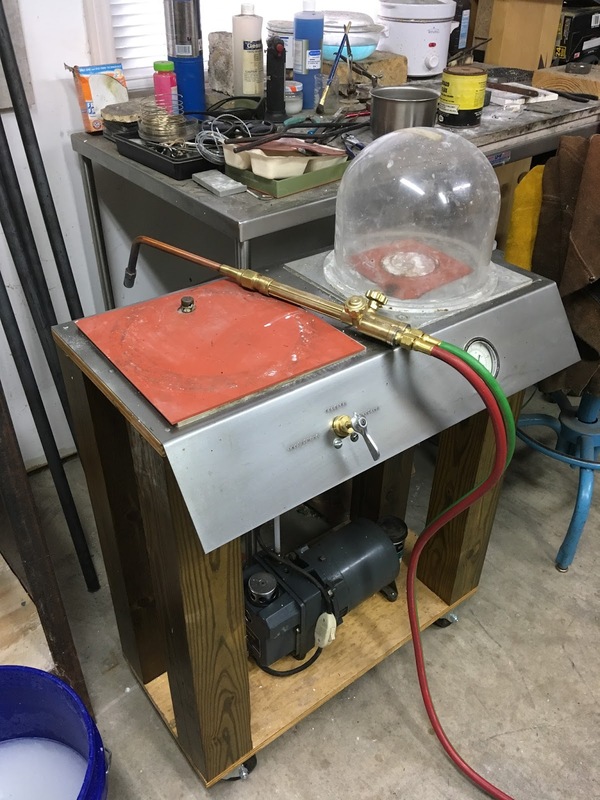 I purchased new hoses, brass pipe fittings, and high-temperature rubber casting pads to connect everything together and complete the setup. The casting machine base assembled and properly sealed. 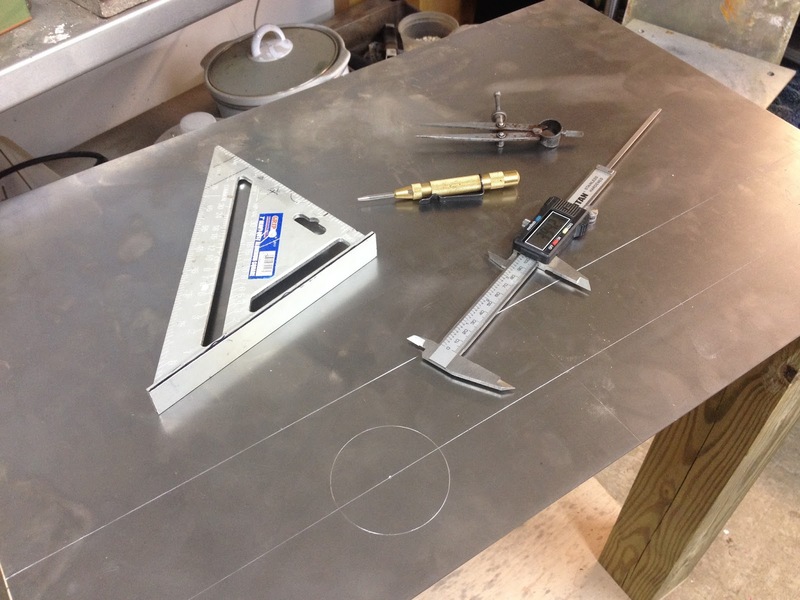 Layout for drilling, cut-outs, and bending of the steel machine top. 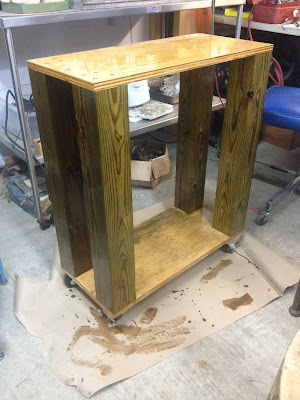 The base of the machine was assembled from plywood, pressure-treated 4x4" posts, rolling locking castors, and several coats of exterior marine varnish to aid in cleanup. 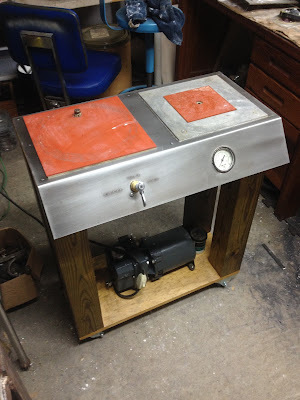 The steel top was drilled for screw and bolt attachment points, a cutout for the vacuum gauge was drilled and hand-filed to fit, valve position indicators were stamped in the steel and highlighted with red lacquer, the front panel face was bent to the proper angle using an industrial bending-brake to allow molten metal and debris to fall away from the workings of the machine during casting, and finally everything was assembled together. The casting machine in use. This concludes all of the major equipment and studio upgrades that were necessary in order to actually fulfill the terms of my grant requirements as specified in my original proposal submission. Part 2 of this blog series will document the welding process from creating samples and getting a feel for the use of the welding torch in the new studio setup to the design and creation of "Observational Solitude", a 7ft tall welded steel sculpture I created to fulfill the large exterior sculpture component of my grant proposal. This project was made possible by the N.C. Arts council, a division of the Department of Cultural Resources, the Blumenthal Endowment and the Union County Community Arts Council.